Yesterday I shared that there’s a new bonus for transferring Starwood points into American frequent flyer accounts: 20,000 Starpoints yields 30,000 AAdvantage miles through July 31. It’s a 20% bonus. Starwood normally transfers 20,000 points into 25,000 miles with most programs. Under this offer that 25,000 miles multiplies by 1.2 into 30,000 miles. 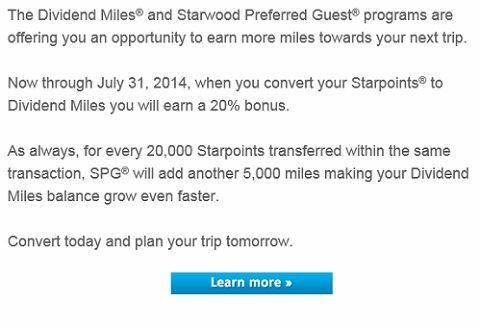 The same bonus is being offered for transfer of Starwood Starpoints into US Airways Dividend Miles. The offer page is here. Starpoint transfers are not ‘live’ and do not post instantly. American offers 5 day holds on awards, US Airways holds are just 3 days making it probabalistic at best as to whether your transferred points will show up in time to issue tickets if you hold an award ticket prior to making the transfer (and it’s unlikely to work if you need to make transfers over the course of more than one day). There does not appear to be any limit to this bonus offer, outside of the theoretical limit to the number of points you can transfer in a 24 hour period. To determine whether the American or US Airways offer may be more appealing to you, you’ll want to review the Ultimate Guide to Constructing Award Tickets Using American Miles and my older guide to booking tickets with US Airways miles. American allows one-way awards at half the cost of roundtrip, US Airways does not. US Airways allows a stopover as part of an award, American does not. There are some airline partners unique to each airline, which could influence your choice. US Airways has MUCH more flexible routing rules. American has more flexible ticket change policies. Both airlines have their own award charts, awards are different prices under each. A great use is 70K SPG for a Nights & Flights II travel redemption which gets you five nights at a Category 4 property PLUS 60K AA/US miles (normally 50K miles).